Hey, the Toronto show was nice, thanks to everyone. And so ends the first few shows with the new band. They've been fun, I'm pretty happy with how everything sounds and I don't feel totally ashamed which is new. Anyway, gonna take some time out and work on the next record and think about what's next. There are a bunch of things that'll need some adjusting as I go forward with the live show - like not losing money for instance. That would be awesome to not lose money. After a lot of planning, promotion, practice and worry, the show in Ottawa last night went pretty good I think. It was the first real club gig with the new band and I was surprisingly happy with the sound. The crowd was energetic and fun, if not as large as I had hoped from the amount of frigging time I put in promoting it. Lots of people sang along with my songs and knew the words and I guess that might be the best feeling in the world. I still feel scared having a laptop on stage. I wish I had a better solution but I don't. I love computers and am good with them but that also makes me aware of how easily they can fail. When girls are dancing on stage all I can think about is "I hope they don't accidentally yank out my firewire cable." So, not exactly a carefree experience. But it was good. Total success basically by all goals I set for it. And I'm looking forward to Toronto next Saturday. And then more shows? On May 27th I was on a phone-in panel for the Open Your World forum talking about Creative Commons. One thing I like about panels is that when they go well there's a lot of interaction. On the phone that does not really happen. I wanted to debate with Daniel James as he seemed to be saying making easier to use music tools is a bad thing, but the phone made it weird. But I got to be on there with Curt Smith from Tears for Fears and am now lying to everyone and saying him and I hang out all the time and are buds. On May 28th I was a (special!) 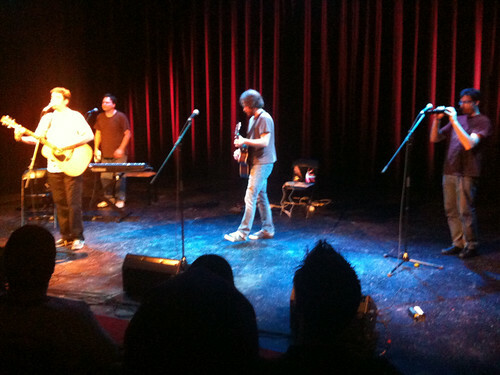 guest at Jonathan Coulton and Paul and Storm's concert in Ottawa. We played SOS by ABBA (my and TheHipCola's cover of which can be found here). Paul and Storm particularly took it to another level with their accompaniment -- and the melodica/acoustic guitar/kaossilator/tamborine solo we came up with moments before the show got big laughs. The audience was so polite it made me nervous I would disappoint them with my life choices. With only a 15 minute turbo setup/sound check I've come to believe it was a success even though there were some hiccups. I feel decent about the sound and will have some shows to announce soon. But I would like to have longer sound checks from here on out, please god please. On May 30th I purchased Red Dead Redemption and spent the next few days drinking and completing it. It was very fun but Jesus Christ, lay off the cutscenes there Rock Star Games. I mean I have to watch a poorly paced ten minute cutscene and then I have to ride my horse next to a guy for another ten minutes while I listen to dialog? NO. YOUR SIMPLE PLOT DOES NOT REQUIRE THAT. And this week it's all been trying to book shows and working on music. On Saturday (June 12th) I'll be backstage at WestFest trying to resist annoying Sloan. May 28 - Ottawa, ON - Jonathan Coulton: My pal Jonathan Coulton will be in town and I will be there. There was some talk about doing a song together but I'm not sure what's happening there. We're doing a song together, who knows what it could be! May 29 - Kemptville, ON - VegStock: This is an outdoor music festival that happens right around the corner from my house. It'll be the first show with the new band and will be kind of a disaster test. June 10 - Montreal, QC: There's a potential show in Montreal for this date but it's not 100% yet. June 11 - Ottawa, ON - The Cajun Attic: This will be a show. June 12 - Kingston, ON - The Mansion: This will be another show. I'd like to get to Toronto and maybe a few other places this summer but I am not the greatest booker. If you have any hook-ups let me know. If you happen to be any of those places, please say hi. Update: June 10th, 11th and 12th shows are no longer happening! Update #2: Updated the Jonathan Coulton show to confirm my participation. The show would be at Beau's All Natural Brewing Company in Vankleek Hill, Ontario. Cost would be $30, which is your cover and a brewery tour. It'd be in the spring or early summer. Anyway, please let me know if it's something you'd attend. Thanks!